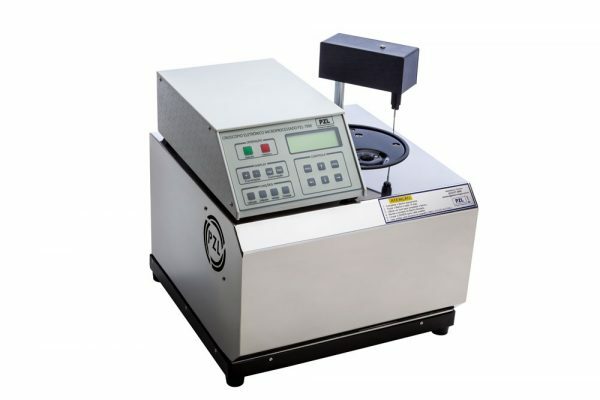 Automatic operation: the operator only doses the sample, the rest is done automatically by the PZL7000, including the calculation of the added water percentage. Reducing the risk of "human error" and also allowing the operator to do other activities while the analysis is done. Automated calibration: calibration through the Cryoscope PZL7000 software, the operator onl has to do the analyzes with calibration solutions. 4 analyzes on the display: display showing the last 4 tests with date, time, freezing point and percentage of water added. Memorization of analysis: internal memory, with automatic record of the last 2500 analysis (even if the power is off). Flexible system: user can configurate for analyzing using the "plateau" (precise) or "time" (faster) system. Cooling system tropicalized: normally operates at room temperatures from 0°C until 42°C; without the need for any forced air conditioning or cooling system equipment. ✓ elapsed time display during analysis. ✓ allows to insert the machine's serial number on the printout of the analysis, increasing the traceability of the sample. Operating range: freezing point from 422 (-0.422°H) until 621 (-0.621°H). Precision (Repeatability): ±0.002°H or ±0.4% of water. Room temperature for operation: 0°C to +42° C.
Reading: LCD display, alphanumeric (80 characters, 4 lines x 20 columns). Cryoscope size: 330 x 370 x 370 mm. Weight: 40 kg (approx. ), with the carrying case. Automatic operation: the operator only doses the sample, the rest is done automatically by the PZL7000 IP, including the calculation of the added water percentage. Reducing the risk of "human error" and also allowing the operator to do other activities while the analysis is done. Automated calibration: calibration through the Cryoscope PZL7000 IP software, the operator onl has to do the analyzes with calibration solutions. Rapid calibration: using only a standard solution of -0.422°H analysis and an analysis of the standard solution -0.621°H. Matrix and Thermal Printer Interface: Enables printing reports or analyzes. Identification of the Producer: In each analysis, it is possible to identify the producer/batch sample being analyzed. The identification can be printed along with the freezing point value individually or through reports. Automatic operation: the operator only doses the sample, the rest is done automatically by the PZL7000 BL, including the calculation of the added water percentage. Reducing the risk of "human error" and also allowing the operator to do other activities while the analysis is done. Automated calibration: calibration through the Cryoscope PZL7000 BL software, the operator only has to do the analyzes with calibration solutions. Calibration solutions with three different concentrations: Ex . : standard solutions 0°H, -0,530°H and -0,962°H. And, instead of requiring the solution to be passed, the user must enter the display the value used. Operating range: freezing point from 0°H to 1000°H.